ANNAPOLIS, MD – Governor Larry Hogan and Agriculture Secretary Joe Bartenfelder inducted the Linthicum Family of Montgomery County into the Governor’s Agriculture Hall of Fame tonight, making the family the 50th recipients of the prestigious recognition. Charles, Tom and Paula Linthicum of Seneca Ayr Farms accepted the honor from Governor Hogan on behalf of the family. The family was inducted in front of more than 700 agricultural leaders and legislators from across the state during the annual “Taste of Maryland Agriculture” event, held at Michael’s Eighth Avenue in Glen Burnie. The leading industry in Maryland, agriculture contributes $16 billion to our state’s economy and supports more than 65,000 jobs. 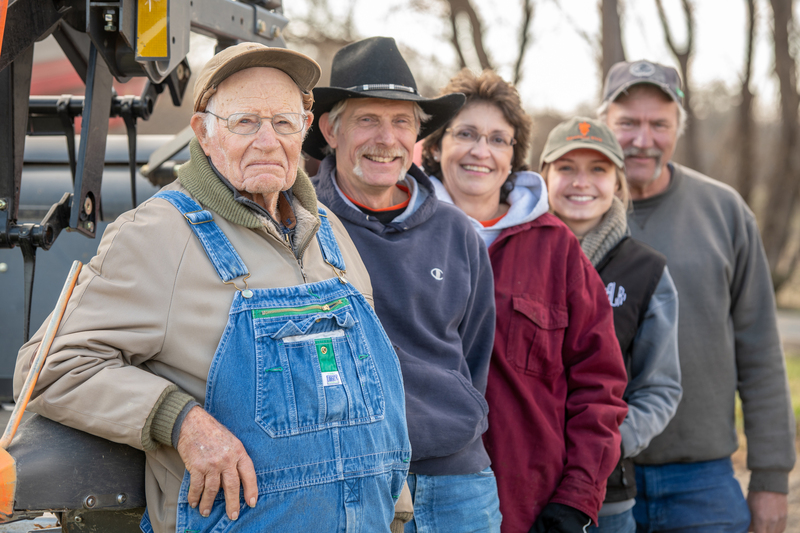 The Linthicum family embodies the kind of resilience and innovation required to maintain a successful multigenerational family farm. With nearly 200 years invested, the Linthicums are the oldest continuously farming family in Montgomery County. That distinction has not come without adversity, but the family’s dedication and hard work has helped them grow Seneca Ayr Farms to embrace the agriculture industry changing landscape and continue to incorporate new technology and conservation practices. The family’s story began in 1826, when Lot Linthicum began farming tobacco in Boyds. At the turn of the century, the decision was made to get out of the tobacco business and move into dairy. As the dairy operation began to flourish, the family suffered a major setback when their house burnt down in 1927. This forced the Linthicums to stop milking cows and refocus their efforts on growing crops and raising livestock. By 1934, the Linthicums were back in the diary business and continued to raise hogs. Over the next several years, the family updated its operation with modern equipment which increased efficiency and allowed them to expand their milking herd. Charles and Juanita, their son Tom, and brother John continued the family dairy business through the mid-1990s, when declining profit margins and aging labor forced them to make yet another tough adjustment. By fall of 1996, the family had decided to auction off their dairy herd and shift their focus to raising hogs and growing field crops. The farm’s old dairy barn was converted into a finishing facility for the hog operation. In 2003, the family bought a farm in Laytonsville, where they now farm over 1,100 acres in Montgomery County’s Agriculture Reserve. The family grows corn, wheat and soybeans in addition to making hay and straw. Sadly, the hog finishing barn burnt to the ground in 2015, forcing the family to sell-off their breeding herd and refocus yet again on raising a small herd of beef cattle. Charles continues to oversee the farm with Tom, Tom’s wife Paula and employee Jimmy Shelton. The family has established themselves as leaders in the agricultural community both locally and statewide. They have remained involved in groups like FFA and 4-H and continue to advocate for agriculture on state, local and national levels. Tom currently serves on the Montgomery Soil Conservation District board. Like many farmers across Maryland, the Linthicum family has a deep love and passion for agriculture. Sponsored by the Maryland Department of Agriculture, the Governor’s Agriculture Hall of Fame was created in 1991 by then Governor William Donald Schaefer to honor agricultural leaders who exemplify high standards of achievement and commitment to the industry and their communities. Nominations are accepted at local Extension offices. More information on each hall of fame family is available on the department’s website. A complete list of Hall of Fame honorees is available online.